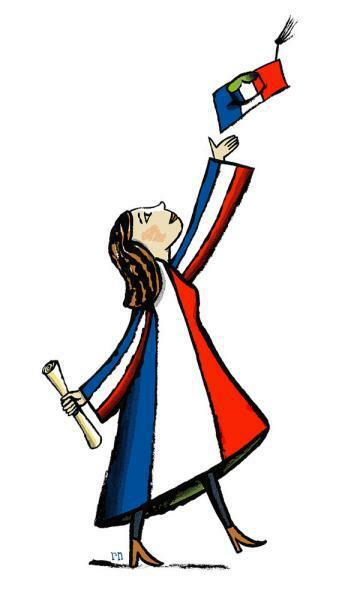 Higher education in France: Lots of testing, lots of planning, not lots of money. Navigating France’s higher-ed system requires lots of planning and test-taking, but not a whole lot of money. Are you a planner or a dreamer? Professionally speaking, which would you value more: job security or the freedom to change careers? And which of these would you find more stressful: taking a test or being in debt? If you’re a planner, if you’re comfortable with compromise, and if you’re uncomfortable with debt, then the French system of higher education may be for you. But if you believe it’s never too late to start over, stick with American universities. If you can afford them, that is. Rising tuition rates in the U.S. have outpaced inflation for the past 30 years. The average annual tuition cost at a private university in 2013 was $30,094, and $8,893 at public four-year institutions. Inflation-adjusted rates from 1971 are about a third of those costs: $10,515 and $2,456, respectively. As a result, seven in 10 college seniors in America now graduate with student loan debt, at an average that’s close to $30,000. To Americans, these kinds of stats are depressingly familiar. In France, though, student loan debt is an alien concept. Fewer than 2 percent of students in France take out loans to pay for their education. The idea that you might have to take out loans is met with disbelief. The vast majority of universities here are publicly funded, with tuition rates set by the government. These public universities, among them the Sorbonne in Paris, cost an average of 183 euros per year for a licence, the three-year French equivalent of an undergraduate degree. The problem here isn’t with the cost of the education, but with the huge amount of tracking, testing, and winnowing that is used to help keep the system free. In America, virtually anyone can get a college education so long as they have the money to pay for it. In France, you can get an excellent, free or nearly-free education but often only if you follow a prescribed set of rules and pass a series of grueling tests that often start early in high school. French teenagers go through their first major career sorting at around age 15, when they decide on an academic or vocational course of study. This choice determines what kind of high-school graduation exam, or baccalauréat, the student will sit for, and to some extent what kind of higher education is open to them. The choice of track is also not entirely up to the students; the head of their lycée, or high school, has the final say. There’s some ability to change tracks, but it’s not particularly easy. The baccalauréat exam is very different from American standardized tests like the SAT. Instead of a single afternoon, the bac is a weeklong process that includes written and oral tests in everything from French literature to math to philosophy. And unlike the SAT, the bac is the sole factor that determines whether a French student will graduate from lycée; grades and extracurricular activities are not considered. Though the bac is stressful for French 18-year-olds, passage guarantees them entry to any of France’s free public universities. However, there’s a second, more elite tier of schools in France: the grandes écoles, France’s version of the Ivy League. They’re extremely difficult to get into—most have acceptance rates under 10 percent—and offer incredible rewards to those who graduate: a recent study by French sociologists François-Xavier Dudouet and Hervé Joly found that a stunning 84 percent of executives at France’s top 40 companies were graduates of a grande école. Contrast this with the U.S., where only about 10 percent of top executives at 100 top companies graduated from Ivy League schools, and you have a sense of the hierarchy that exists in France—a country that supposedly executed its ruling class more than 200 years ago. Ironically, the first grandes écoles were established after the French Revolution as an egalitarian means of training the talented sons and daughters of the middle class. They’ve evolved into a powerful proving ground. Among the major grandes écoles are Ecole normale supérieure (abbreviated to ENS, and the only one of France’s university’s to make it into the top 100 internationally), which trains scientists and academics; Polytechnique, which trains largely scientists and engineers; and the business schools HEC and ESSEC. Above these sits ENA, the École nationale d’administration, which takes top graduates of grandes écoles and trains them for high-level government positions. The school only graduates 100 students per year, yet it’s so dominant that it counts two former French presidents and the current president, François Hollande, among its alumni. * By U.S. standards, the grandes écoles are a bargain—ENS and Polytechnique even pay their students a monthly stipend to attend. In return, students are expected to work for the state for several years after graduation (though ENS is trying to eliminate this requirement). After passing the bac, most aspirants to a grande école attend a cours préparatoire; commonly known as a prépas: two years of intense study in their chosen field. At the end of the prépas they sit for the concours, another entrance test that is nationally ranked and will determine which grande école, if any, they will attend. Though the public prépas are designed to be affordable for all, they are also extremely competitive, and there’s very little in the way of college counseling in France. Here and elsewhere, the process can be opaque, and it privileges those who come from families who know the process. The privileging of the grandes écoles over the public university system is also reflected in education spending, with the state spending just 6,700 euros per public university student per year but up to 13,000 euros per student at a grande école, even though elite schools train only 5 percent of students. People who want to be doctors or lawyers often retake the first year several times, in hopes of passage—each time, costing the government more money. The Ministry of Education would like to limit the number of times these tests can be taken. In a way, this makes sense—the government is paying to train the doctors, they want to make the decisions about who will and won’t progress in the profession. But of course, there are other skills that go into being a doctor besides the ability to pass a government exam. The French system works beautifully if you’re extremely focused from a very early age, work well under pressure, and are great at taking tests. It works less well if you’re not sure at age 16 exactly what you might want to do with your life, or if your family members and peers aren’t already familiar with the system. The lack of flexibility in the French system is a contributing factor in the high youth unemployment in the country, currently at about 25 percent. These carefully constructed career tracks may lead nowhere if students can’t change course without unnecessary penalties. On the other hand, that kind of freedom of choice comes with a huge price tag in the United States. Is it better to tell a student at age 20 that the state will not pay for him to become a doctor, as they might in France—or let him pay to become one and accrue an average of $170,000 in personal debt, as we do in the U.S.? I know I wouldn’t have the career I have today if I’d grown up in France—I would probably be a lawyer, as my parents initially wished. But I also wouldn’t have racked up $30,000 in student loan debt, which is enough money to make a dreamer into a planner. Correction, Feb. 7, 2014: A previous version of this article misstated how many former French presidents attended ENA; it was two, not three.